I spent two full days and three evenings in Hanoi, which wasn't nearly enough time to explore all that the Vietnamese capital has to offer, but I did manage to visit eight cafes. Hanoi is famous for its unusual coffee concoctions, such as egg coffee and coconut coffee, which I had to sample, but I also found a few good spots for western-style speciality coffee. The map below includes coffee shops from Hanoi, Ho Chi Minh City and Hoi An, so you will probably need to use the zoom. I visited Boeing Coffee on the way back to the Old Quarter from Maison de Tet Decor (see below). As the name suggests, it is a cafe that has been designed to look like the inside of a Boeing aeroplane. It overlooks Trúc Bạch Lake and serves Vietnamese coffee and espresso-based drinks. In a failed attempt to cool down, I ordered an iced black coffee (30,000 VND; £1), which I sipped while I enjoyed the views. The menu also includes some intriguing blended ice drinks, such as 'Cookie Calamity' and 'The Elegant Irish'; I suspect they are probably much too sweet for me, but if you like that sort of drink, you may be in luck. Boeing Coffee Shop is located at 29 Trúc Bạch (Ba Đình). Facebook. Instagram. The rooftop of Cafe Phố Cổ has a great view over Hoàn Kiếm Lake, which is lucky, because it takes a little bit of effort to get there! You enter through a silk shop on Hàng Gai, proceed through the alleyway and climb several increasingly precarious flights of stairs, one of which was being guarded by an extremely cute ginger cat. The view is well worth it, though: you can see down to the lake's Turtle Tower and Thê Húc Bridge, and that high up, there was a rare breeze. I had an iced black coffee (30,000 VND; £1), which was pretty good, although not amazing. In case it isn't already clear, the view is the primary reason for heading to Cafe Phố Cổ. Cafe Phố Cổ is located at 11 Hàng Gai (Old Quarter). TripAdvisor. Attracted by the cool copper coffee machine on the bar, I noticed RuNam on my first evening in Hanoi, but didn't visit until my last day, after I realised that it also came with a Fancy a Cuppa endorsement. Aside from the beautiful decor, RuNam has an extensive coffee, tea and dessert menu. They serve espresso-based drinks but as it was my last coffee before leaving Vietnam, I decided to have a final iced, black, Vietnamese-style coffee. At 81,000 VND, it was the most expensive Vietnamese coffee of my trip, although at £2.50, it was hardly breaking the bank. The coffee was very well prepared and had a complex, fruity taste. It was also exquisitely presented on some gorgeous blue ceramic tableware. RuNam also has several sister cafes and bistros in Ho Chi Minh City, Da Nang and Nha Trang. Càfê RuNam is located at 13 Nhà Thờ (Cathedral District). Website. Instagram. There are 16 coffee shops in Cộng Càphê's mini-empire. I went to one of Old Quarter branches for a post-dinner treat one evening. The decor was both cosy and quirky, with floor cushions and low tables for relaxing over a coffee, and vintage posters and military-themed objets d'art on display. I had heard that this was a great place to try a coconut coffee, so that's what I ordered (45,000 VND; £1.40). Very sweet and not unlike a Frappuccino, the drink blended coffee, coconut milk, fresh coconut and ice. It was delicious, although in my opinion, much more of a pudding than a coffee. Cộng Càphê is located at 41 Hàng Điếu (Old Quarter). There are 15 other branches in Hanoi and other cities. Website. Twitter. This cafe was recommended to me by My from Rosie's Cafe in Hoi An as an authentic place to grab a Vietnamese-style coffee. It is hidden away down a very unpromising alleyway on the busy road that runs along the north side of Hoàn Kiếm Lake. At the end of the alley, you head upstairs into a small, dark room filled with young Hanoians. There is a small balcony that looks out onto the lake and I was lucky enough to find an empty seat in prime position. The egg coffee is supposed to be very good here, but I had already had my fill, so I just ordered an iced black coffee instead (a bargain at 17,000 VND; 50p). The coffee was good, although not outstanding, but the view and the ambience were both excellent. Đinh Cafe is located at 13 Đinh Tiên Hoàng (Old Quarter). Facebook. When in Hanoi, you have to try one of the fêted egg coffees, which combine coffee, whisked egg yolk and condensed milk. I wasn't convinced I would like it, but several people told me that Giang Cafe, in the heart of the Old Quarter, was the place to give it a go. The cafe is tucked down a little alleyway and early on a weekday morning, the upstairs cafe was heaving. I managed to find a seat at one of the many small, low tables and ordered the coffee (20,000 VND; 60p). It was actually a lot more pleasant than I was expecting: smooth and very creamy, although too sweet for my taste. Giang Cafe itself is rather characterful with a nice ambiance and local artwork on the walls. Giang Cafe is located at 39 Nguyễn Hữu Huân (Old Quarter). Website. I visited Maison de Tet on the recommendation of Trung from The Espresso Station in Hanoi. It is located on a quiet street overlooking West Lake, a good 45-minute stroll from central Hanoi, but it was well worth the effort. It serves a wide range of single-origin coffees and coffee blends, with beans from Vietnam and further afield, which are roasted on site each day in small batches. Each coffee can be prepared with an impressive variety of brew methods, including espresso-based drinks, pourovers, Vietnamese-style coffee and cold brew. I was hot and tired when I arrived but the Ethiopian ('Wind') cold brew (60,000 VND; £2) really hit the spot. It was smooth and refreshing, and came with a little serving of honey, which I didn't try, and a biscuit, which I did. I also tried a Vietnamese-style coffee (45,000 VND; £1.40), made using the 'Thunder' coffee (a blend of arabica and robusta coffees from Vietnam). I had the coffee with condensed milk — when in Vietnam, and all that — which was too sweet for my liking, but the coffee was very well prepared. You can buy bags of beans, and the cafe also serves sweet treats and has an amazing-looking brunch menu. I sat in the cool downstairs patio, but the upstairs section has a great view over the lake; the cafe's interiors, meanwhile, are stylish and chic. I just wished Maison de Tet was a little closer to the city centre so that I could have gone back for brunch. Maison de Tet Decor is located at 36 Từ Hoa Công Chúa (West Lake). Website. Facebook. Instagram. Oriberry is a fair-trade coffee company and social enterprise with a small cafe just opposite St. Joseph's Cathedral. There are a handful of small tables inside and the shop also stocks bags of Oriberry beans and a great selection of beautiful fair-trade ceramics from Indigenous. They had some particularly beautiful monochrome ceramic coffee drippers. They serve Vietnamese-style coffee and espresso drinks. I had a macchiato (35,000 VND; £1.10), which was rich and smooth. Oriberry Coffee is located at 36 Ấu Triệu (Cathedral District). Website. Twitter. Thanks for the link. 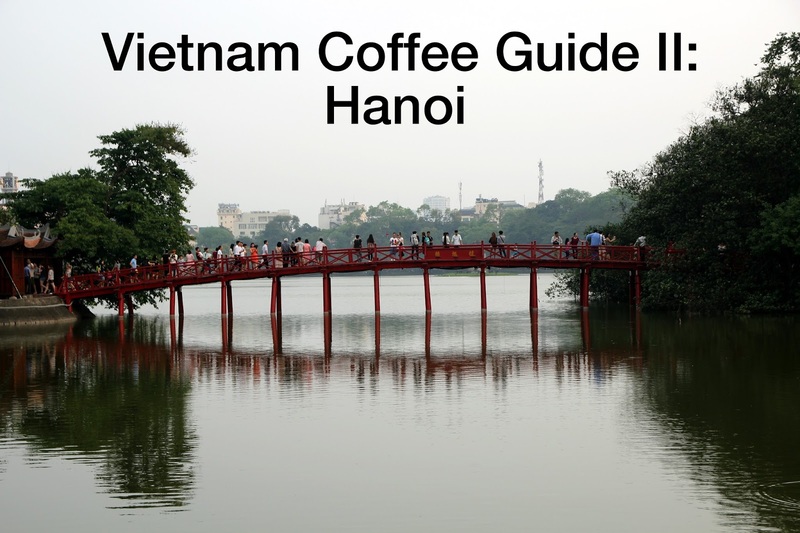 Yes, I did finally make it to Vietnam and used your coffee guides extensively. The views from the Old City Cafe were indeed excellent and the egg coffee was, shall we say, interesting! There was no cat though :-(. I never made it out of the Old City (I was only there for two days) but I loved it. Cafe RuNam and Oriberry Coffee were excellent and I found a couple of new places which had only opened in the last year (so after you were there).